The simplest report customization is to change an existing data field, along with its corresponding label. A label is generally positioned in a Header section of a report, while a data field is positioned in the Detail area. You can also adjust the size and positioning if needed to display the new content. 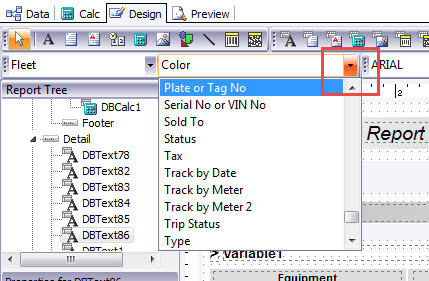 For this example, I will customize the " Equipment Listing" report by changing the Color field to License Plate. 4. Highlight the text in the Edit Toolbar (it should turn blue) and type " Lic. Plate"
5. If you need to adjust the size or position of the label, hover your mouse over any circle in the border of the label until your cursor changes to a double-headed arrow. Then click and drag to the desired position.